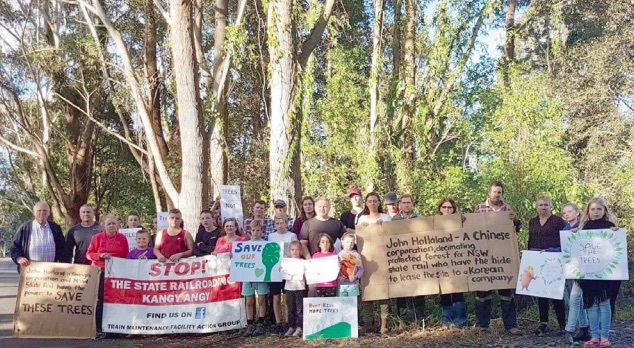 The NSW Environmental Defender’s Office (EDO) has stepped up to represent Kangy Angy residents as they fight to save a stand of mature trees in Orchard Rd that were not earmarked for removal in Transport for NSW plans for its innercity fleet rail maintenance facility. The EDO wrote to Transport for NSW on Tuesday, July 31, seeking to stop the removal of the trees and questioning whether Transport for NSW had consent to do so under the Federal Environment Protection and Biodiversity Conservation Act (EPBC Act). According to the EDO, the trees constituted “habitat for the critically endangered Regent Honeyeater and the Swift Parrot. “Those species are protected from actions which will have a significant impact on the species, without first obtaining (and complying with) a valid approval granted under the EPBC Act. “Our client is concerned that Transport NSW is proposing to clear a stand of native trees, including gum trees, blackbutts and bloodwoods, in the vicinity of Orchard Rd… without appropriate legal authority under the EPBC Act, or the Environmental Planning and Assessment Act 1979 (EPA Act, NSW),” the EDO said in its letter. “Based on our review of the Review of Environmental Factors prepared for the Project, it would appear that the Project, as approved, proposes to retain the vegetation along Orchard Rd,” it said. “We are instructed that our client has requested copies of the revised plans that Transport NSW says now authorises the clearing of these trees that were to be retained, however, they have not been provided with any such plans. “Without access to the relevant revised plans, it is not clear to us that Transport for NSW is now authorised to clear the trees that were to be retained. “In order to confirm whether the proposed clearing is authorised by the EPBC Act approval for the Project, we require, as a matter of urgency, copies of the revised plans that Transport for NSW relies on to authorise the clearing of this area. “If the plans have been submitted for approval by the Department, we require a copy of the plans and the relevant approval by the Department. “Transport for NSW is required to obtain separate approval before trees are removed where the impact was not identified or assessed in the original environmental impact assessment for the Project “Given that the vegetation along Orchard Rd was proposed to be retained, our view is that a separate approval is required before trees in this location may be removed. “We request a copy of the separate written approval that now authorises the clearing of the trees that were to be retained. “Transport for NSW is required to publish any such plans, in any event, on its website, within one month of approval. “Accordingly, our client, as a member of the public, is entitled to have access to the plans.” Until such time as those plans have been provided and our client has had the opportunity to obtain legal advice in relation to the lawfulness of the clearing of the trees, we request, on behalf of our client, that no clearing of the trees in the vicinity of Orchard Rd takes place.” The EDO requested provision of the documents from Transport for NSW within 48 hours of receipt of the letter. On Thursday, August 2, Tracey Stewart from the Kangy Angy Residents Action Group (KARAG) said the trees, estimated to include mature trees that are at least 100 to 120 years old, had not been removed. “Residents have been keeping vigil every day from 7:00am to 8:00pm,” Stewart said. “The contractor has stopped work, but the EDO has not yet received any correspondence,” she said. Parliamentary Secretary for the Central Coast, Scot MacDonald, called for a 24-hour halt to works on July 31, but his request was not complied with by Transport for NSW. Central Coast Mayor, Jane Smith, and Councillors, Louise Greenaway, Bruce McLachlan and Jeff Sundstrom, visited the site to offer their support to residents. “We believe the removal of trees from Orchard Rd was not in accord with the EPBC Act and that there should be no trees taken from Orchard Rd,” Tracey Stewart said.